This piece originally appeared 10/5/16. PlayStation VR is Sony’s answer to cutting-edge VR headsets like the Facebook-backed Oculus Rift and the Valve-backed HTC Vive. On paper, it offers much the same experience as its competitors at a lower price, powered not by an expensive gaming PC but by a somewhat less expensive PlayStation 4 console. I’ve been using the PSVR for the better part of a week and have played a handful of the games that will be available at launch. I’ve been impressed by some things, turned off by others, and made nauseous by a few. Throughout that time I’ve also been disappointed. Sony’s lovely, well designed headset is consistently undermined by inferior motion controllers, an underpowered console, and a lackluster camera. PSVR is out next week on October 13. If you buy one, it’ll run you $400 for the headset, or you can opt for the $500 bundle, which includes a couple of Move controllers and a PlayStation camera. Above: What’s in the $500 bundle, more or less, minus a few cables and the stereo earbuds. The bundle also comes with PlayStation VR Worlds, a suite of short demos and VR games. The Move controllers are a known quantity. They came out in 2010 for the PlayStation 3 and work like Wii Remotes. Sony’s push for the Move came and went a long time ago, but the controllers still work with the PS4. The camera is familiar, too—it launched alongside the PS4 and has existed as an odd, underutilized peripheral ever since. The headset, of course, is new, as is the ambitious attempt to use the PS4 to tie all three pieces of technology together into a coherent VR system. Let’s talk about what this thing does well and what it does less well. 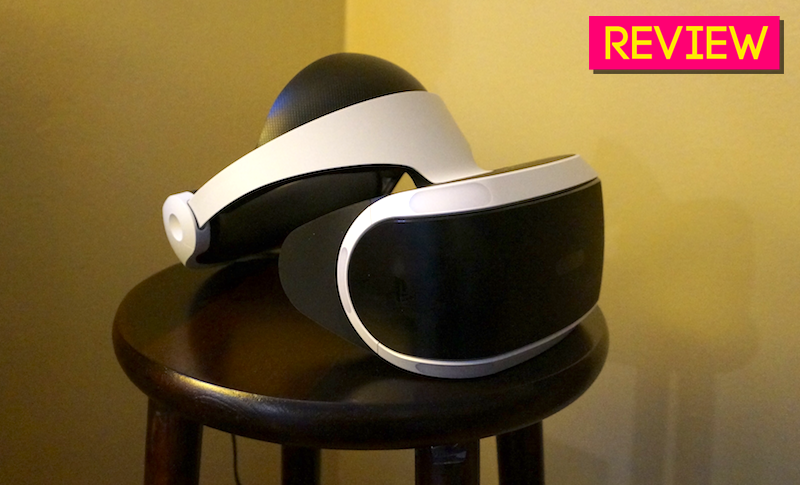 It offers a cheaper, still impressive version of modern VR. We’ve got three major VR headsets at this point, with more on the way. Each one stands on its own as an entertainment device, and each also makes a particular sales pitch for VR as a new way to experience virtual worlds. While each headset puts its unique spin on that pitch, the basic trajectory remains the same. VR is fundamentally cool. Once you’ve used one of these headsets, you’ll probably want your friends to see it. At times, it makes you feel like you’re “there.” A giant shark will loom toward you out of dark water, and your adrenaline will spike. You’ll peer out over a precipitous drop and your guts will do a backflip. A cute little critter will run up to your feet and you’ll instinctively try to pet it. 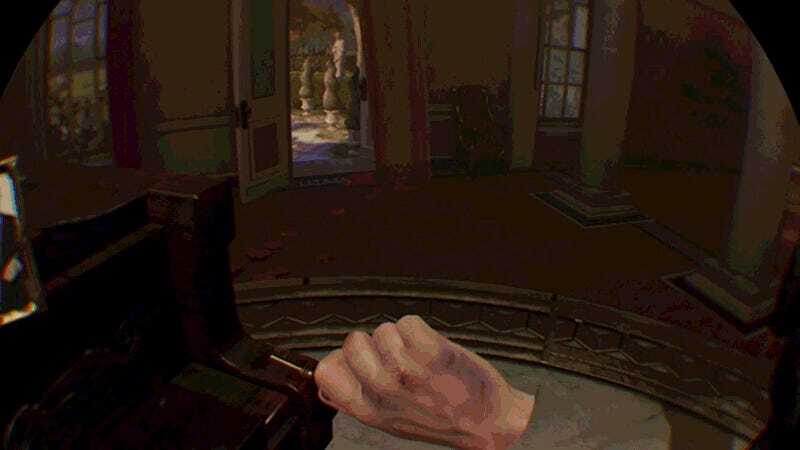 You’ll use a motion controller pick up an object off of a nearby table and turn it over in your hand, marveling at how part of your brain really thinks you’re holding it. PlayStation VR manages all those feats, albeit with more suspension of disbelief required than the competition. It will initially feel familiar to anyone who has tried out an Oculus Rift or an HTC Vive. If you’ve never tried either of those two headsets, you’ll probably be more immediately impressed. You won’t notice the funky head tracking. You won’t mind that your in-game hands are constantly stuttering. You won’t be as put off by the blurry graphics or frame-rate dips. In fact, there are probably people for whom that will be enough. To its credit, PSVR does convincingly convey the niftiness of modern virtual reality, and it does so powered not by an expensive gaming PC, but by a game console that millions of people already own. Let’s not kid ourselves. It’s still very expensive. Most people will have to pay $500 for PSVR, which is the price of the Move + camera bundle. That bundle comes with a disc containing demos of several VR games, as well as PlayStation VR Worlds. You’ll have to buy other games separately. At $500, PSVR is indeed a more affordable option than the competition. The Oculus Rift costs $600 and will cost even more once its Touch controllers launch later this year. The HTC Vive, which comes with its own handheld controllers, costs $800. Moreover, the Rift and Vive both require powerful gaming PCs that can cost two or three times as much as a PS4, if not more. PSVR may be the cheapest of the big three VR headsets, but that only means it’s the cheapest of three very expensive things. But let’s not kid ourselves: A relatively cheap VR headset is still awfully expensive. You could buy a new gaming console for $500 and still have enough cash left over for a few games. You could buy a cutting-edge smartphone and have enough left over for a year of online storage and streaming music. You could buy a secondhand ticket to Hamilton. One of the best launch games, Super Hypercube, will cost you $30, and most of the other games are in the $20-40 range. The multiplayer tank-wars game Battlezone costs a whopping $60, which certainly seems high for what I’ve played of it. So, some perspective. PSVR may be the cheapest of the big three VR headsets, but that only means it’s the cheapest of three very expensive things. It’s pretty easy to set up, but requires some adjusting. The PSVR isn’t all that difficult to set up. You run a passthrough HDMI cable from the small new PSVR receiver box to your TV, and another HDMI cable to your PS4. You plug a USB cable from the box into your PS4. You plug the headset into the box. You sync the two Move controllers and plug in the camera. You put the camera on top of your TV. You run a quick calibration, and that’s pretty much it. However, I’ve found that the PS4 can require an annoying amount of adjusting in between games. I’ve yet to find a sweet spot where I can play any game standing up, sitting down, or anything in between. A few times, if I’ve wanted to sit for one game and stand for another, I’ve had to adjust my camera so that my head stays set within a small box. Other games have told me I’m leaned too far back, out of the play area. You can reset the orientation by holding down the Options button mid-game, which resets the horizontal and vertical orientation of the game. Weirdly, I’ve found that some games begin to rotate ever so slightly to the left or right as I play, an annoyance that the Options button appears powerless to fix. 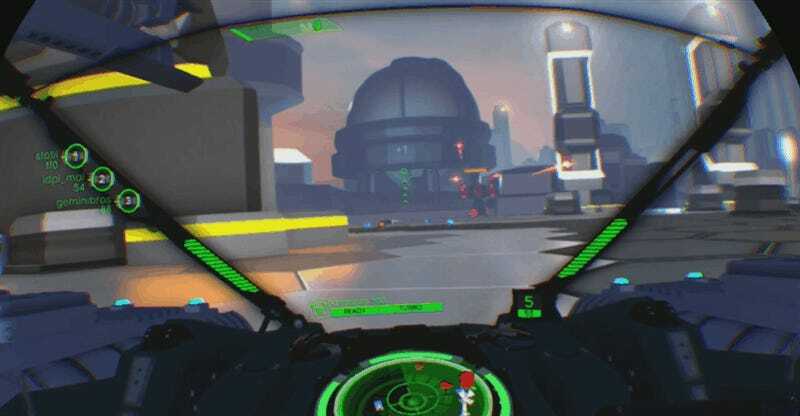 At one point my Battlezone cockpit rotated until I was sitting at an angle on my couch, seemingly unable to make the game point me back forward. It wasn’t until I started a new game that it went back to normal. When you turn the headset on, your PS4 dashboard immediately pops up in the headset and you’re off to the races. The ease with which I can go from “not playing VR” to “playing VR” is admirable, and makes it much easier to decide on a whim to put on the headset and play some games, or show it to friends I’ve invited over. Whatever annoying calibration steps are required, PSVR does remove a lot of barriers between you and playing a game. The headset is a nice piece of electronics, smartly designed and comfortable for extended periods of time. It also plays well with glasses—even my big chunkers—though if given the option I’d still prefer to wear contacts. Rather than strapping to the front of your face, the PSVR eyepiece hangs down from a plastic halo-hat that goes around the crown of your head. You can easily open the halo by pressing a release button on the back. Once you’ve got it on, you can fine-tune the fit by turning a knob next to the button. You can also press a second button to independently slide the face-mask forward and backward, which makes it a cinch to fit over your glasses without smushing them into your face. The optics themselves fit comfortably and are framed by soft rubber blinders that gently block out most outside light from around your eyes and nose. It breathes well, and my face rarely feels crowded by the PSVR in the way it often does by other VR headsets. As a bonus, it’s easy to scratch your eye or nose while playing. (Seemingly a small thing, but actually very nice!) I do find that my hair frequently falls down into my eyes and obscures my vision, but I guess I need a haircut anyway. I can’t tell you exact numbers, but the headset’s field of vision feels open. In a given VR game I rarely noticed the black binocular effect happening outside of the visible area. In-headset visuals are clear, and the blurriness and frame-rate issues some games have are likely more due to underpowered graphics processing hardware than any deficiency in the headset. The headset does contain a lot of interlocking, breakable plastic parts, and the fitting mechanism in particular seems like it will degrade over time. But overall: Good headset. Above: I’m holding the controller perfectly still. 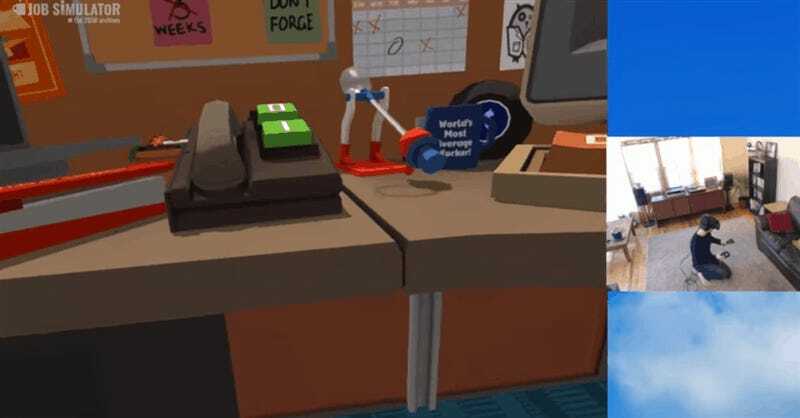 Above: Job Simulator on HTC Vive. Above: Job Simulator on PSVR. I hadn’t even kneeled down and the camera lost sight and my hands floated away from me. Some of the games are neat, but so far most aren’t that exciting. Even the most amazing gaming hardware will fail if it doesn’t have any good games. The inverse of that is also true. Lackluster hardware can be saved if the games are good enough. From what I’ve played, the PSVR’s game library fails to make up for the hardware’s shortcomings. That could change as Sony sends along more launch games, however. Super Hypercube is the most consistently enjoyable of the games I’ve played. It’s a simple, ingenious Tetris-inspired affair that conceptually places you above an ever-growing 3D tetromino and has you rotating it to make it fit through a hole in the floor before it collides. The effect of playing the game, however, is that of slamming forward through a series of tiny keyholes in a neon starscape. Other games are less exciting. Arkham VR is a brief return to Rocksteady’s gritty take on Gotham City, and mostly feels like a series of somewhat interactive cutscenes. Most of the scenes have you standing still and looking around. Amusingly, action will often take place against a black loading screen, with combat sound effects playing in your ears like an old Batman radio play. 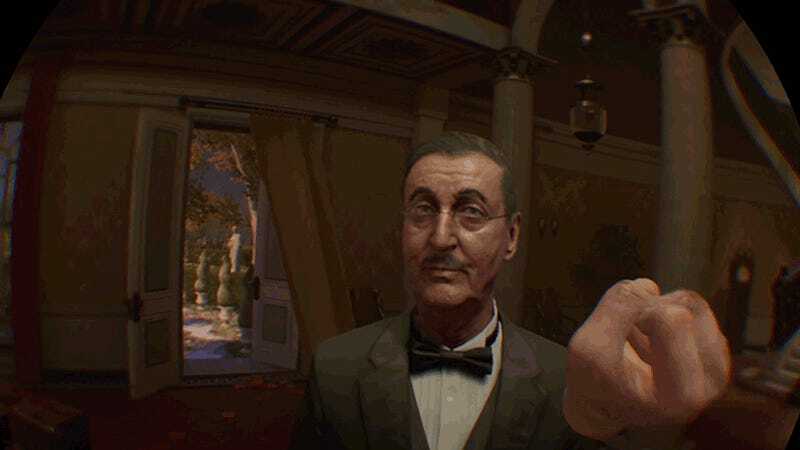 The most interesting sequence has you working through one of the Arkham games’ holographic crime scenes, rewinding and pausing playback of the action to attempt to figure out what happened. 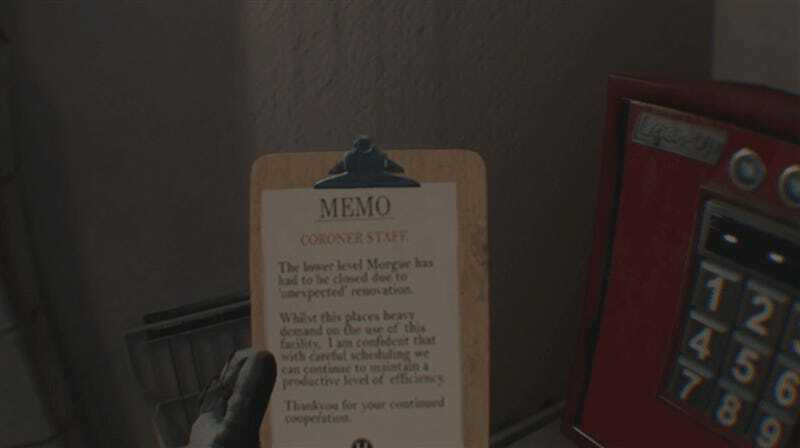 It’s the sort of thing that could make for a fascinating crime scene investigation game, were that the sole focus. Unfortunately, it’s just a small part of the game. Battlezone places you in the cockpit of a tank that feels straight out of Tron and lets you play alongside up to three friends as you take on fleets of enemy vehicles. I played this one online with a few people and it never quite gelled for me. Even on easy, we were constantly getting killed, and after about an hour I felt like I’d seen all there was to see. My tank would also frequently clip and lock into my teammates’ tanks, triggering a sort of mecha-body horror that’s difficult to put into words. A demo of Rez Infinite was nifty but often visually overwhelming and suffered from perplexing frame-rate issues that will hopefully be absent from the full game. PlayStation VR Worlds is a familiar collection of “wow look at the cool VR!” demos and mini-games, including a somewhat nauseating street luge ride and a scripted encounter with a terrifying fucker of a giant shark. 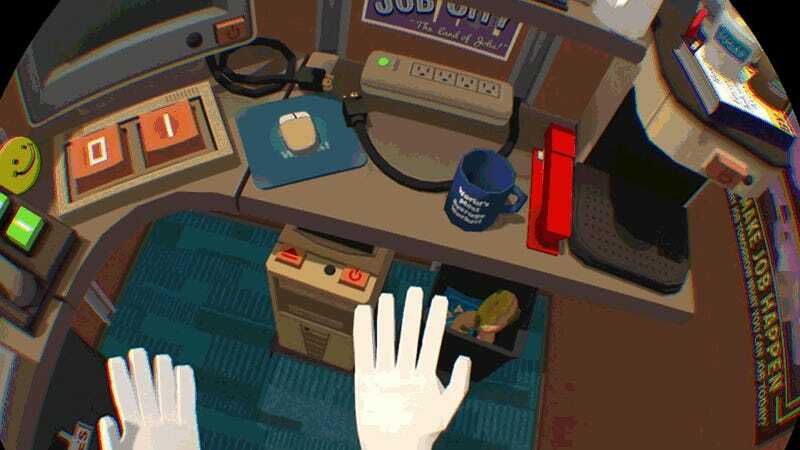 Job Simulator is silly fun but as I’ve mentioned is inferior to its other versions. It’s hard to be optimistic about the future. All last week, I kept coming back to the fact that the PSVR peripherals I’ve been using are mostly failed Sony hardware products. The Move motion controller came out six years ago and failed to catch on as an alternative to the Nintendo Wii. The PlayStation camera launched in 2013 alongside the PS4 and failed to become even as useful as the not-that-useful Xbox Kinect. The PSVR, then, starts to feel like Sony’s Island of Misfit Toys. 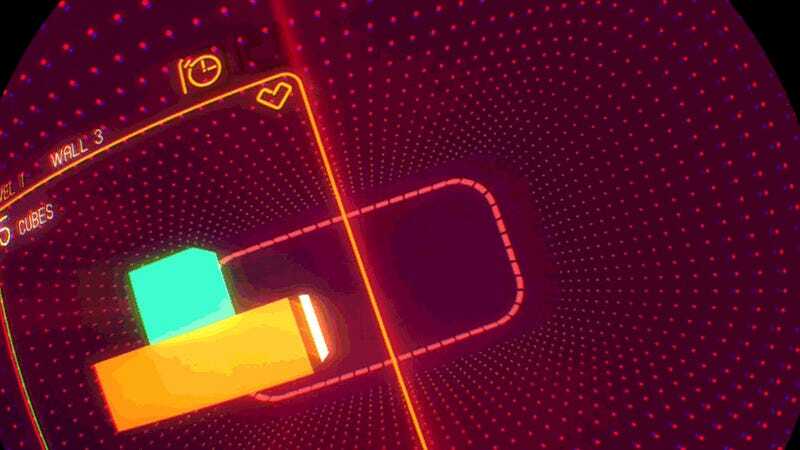 It’s a magnet for gadgets that didn’t succeed on their own merits, and it’s hard to believe that, together, they might finally break through. Back in 2014, Sony’s Richard Marks explained to us that, in a way, the Move didn’t meet its potential because it was designed to work within a 3D space, rather than the 2D screen to which it was initially constrained. 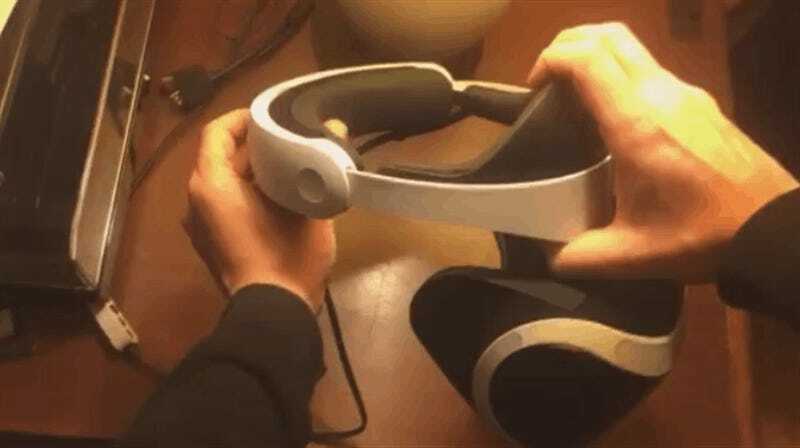 But the fact remains that Sony is not using the concept of the Move for their new VR controller. They’re using actual six-year-old Move controllers. It’s admirable that they’ve gotten the results they have, but hard to overlook how far behind the old tech is lagging. The PSVR starts to feel like Sony’s Island of Misfit Toys. The upcoming PS4 Pro will offer significantly more processing power than the current PS4, which Sony says will allow VR games to potentially run at higher, more consistent frame-rates. We’ll certainly report back on how the PS4 Pro does with the current slate of PSVR games, but all the GPU horsepower in the world can’t make the Move and the PlayStation camera any less outdated. Furthermore, if the PS4 Pro does wind up being the preferred way to play PSVR games, the extra cost of the new console puts a significant dent in the PSVR’s appeal as a lower-priced VR alternative. If you buy a PSVR, you’re locking yourself in with Sony and hoping they continue to support the headset. Ironically, both the Move in your hand and the camera on your TV are reminders that Sony frequently does not support their hardware, and for all of Sony’s assurances about their commitment to VR, I’m skeptical that the PSVR will be any different. Unlike competing PC headsets, it will be much harder for the PSVR to find an extended life though hacks and independently created software. If Sony decides to stop supporting it, it will fast become one more hunk of plastic sitting in the closet. The PlayStation VR narrative goes like this: While HTC and Oculus have been off making expensive, cutting-edge headsets for high-end PC gamers, Sony is swooping in with a more approachable, affordable alternative for everyday people. I have my doubts about that narrative. My sense is that VR as a whole is just not there yet, and that Sony is valiantly attempting to make the first mainstream version of a technology that is not yet mature enough to go mainstream. It’s certainly possible that I’m wrong. The PSVR could wind up being good enough, a curious designation that is difficult to predict or assign. The Nintendo Wii had lousy graphics that couldn’t compete with the Xbox 360 and the PS3, but its motion controls were good enough that it became a global phenomenon. The original N64 Goldeneye was in many ways inferior to the first-person PC games of the era, but it was good enough to get people excited about a console FPS years before Halo. Correction: An earlier version of this review stated that the $500 bundle only came with the free VR demo disc. It actually comes with PlayStation VR Worlds, which costs $40 separately. We’ve updated the review.